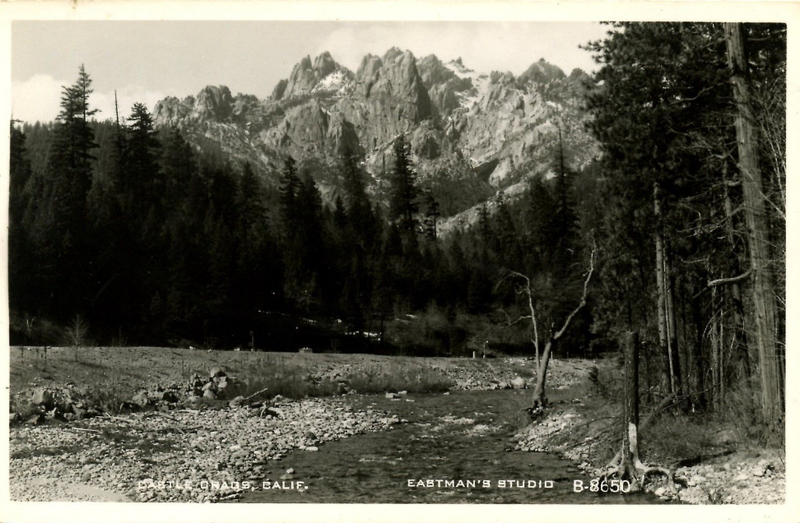 Postcard View Of The Castle Crags? The last few years my brother has been bringing his sons’ cross country team from Carmel up here to Mount Shasta in order to train at some higher elevations. My parents come up too and like to grandparent all the runners and make sure that everyone has a good time. Fortunately our guest cabin is large enough to accommodate 20-25 people fairly comfortably. When my parents showed up a couple of days ago in preparation for my brother’s crew’s arrival, my mom produced a little goodie she thought I might be interested in. Now, my mom is an avid thrift shopper (read: addiction) and every now and then she turns up some pretty amazing stuff. One of the more interesting was a 100 year old painting of Mount Shasta (see details here and here). One of her most recent acquisitions was a brand new, unused one of these. It certainly is a spectacular shot and one that really highlights the rugged nature and massive bulk of the Crags. Set in late fall or winter, the Sacramento River flows around a bend while the Castle Crags loom magnificently in the background. A layer of snow covers the ground, though not the trees. Power lines that run parallel to the railroad tracks can be made out though they are not immediately obvious. Overall, it is a stunning scene, and one that seemingly ought to be more commonly photographed given how impressive it is. 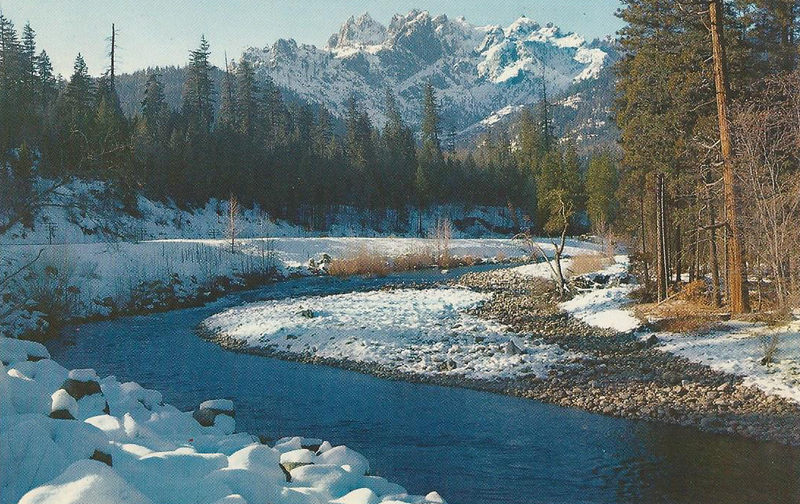 The backside of the postcard notes the Castle Crags and their awesome presence above Highway 99. It further states that travelers on the highway often camp at the state park. 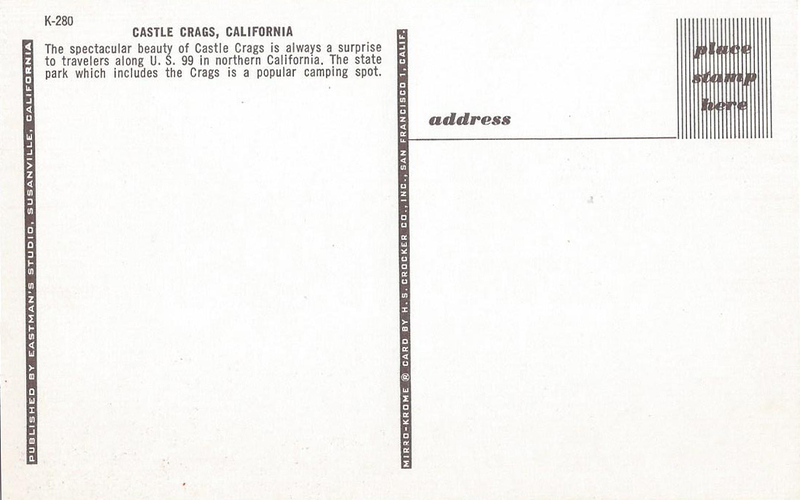 The fact that it refers to Highway 99 rather than Interstate 5 dates this card sometime prior to the mid-1950’s. 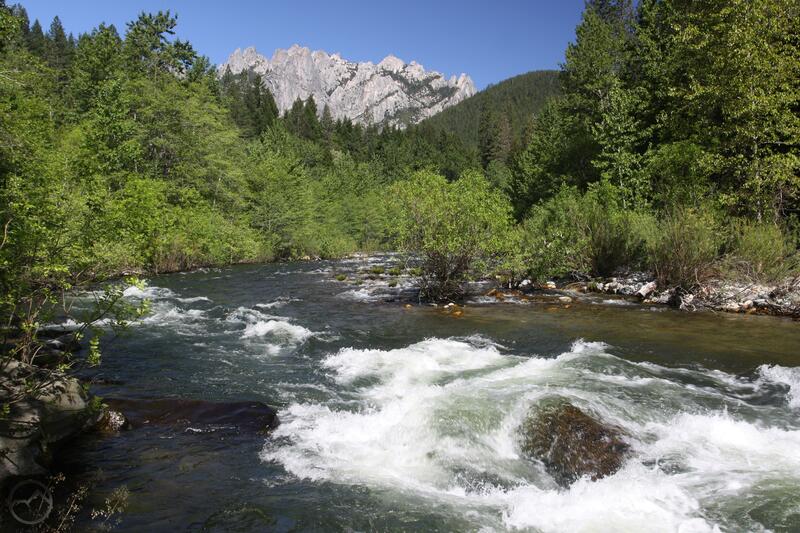 The mention of Castle Crags State Park dates the card to sometime after 1933, when the park was established. If I had to guess, based on the aesthetics, I would put it somewhere between 1945-1955. Naturally, with such an astounding view of the Crags, I wanted to locate the spot it was shot from. I figured with the direction of the river’s flow and the presence of the railroad tracks, it would not be too hard to determine where the picture was photographed. I hunted around on Google Earth a little bit before I realized that I had already been to this spot! I had initially thought of this location when I first saw the card but I dismissed it as a possibility because of the arrangement of the railroad tracks in relation to the river. They are not visible in this shot, but they are set way back from the water, much further away than they appear on the postcard. Yet the Crags themselves were a dead ringer for what is seen in the card. 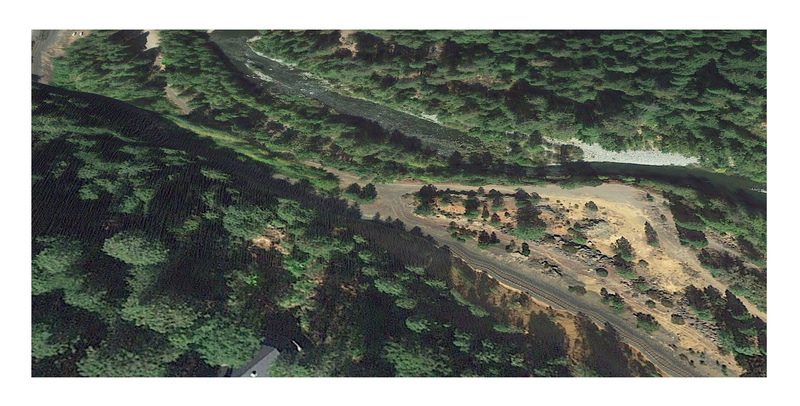 I snooped around on Google Earth a little more, looking at the Crags in relation to the orientation of the river. The perspective in the image I had taken of the Castle Crags was so similar to the one on the postcard I knew that if it was not the same spot, it had to at least be close. Nonetheless, there is nowhere else on the river that even comes close to having the same alignment between the Sacramento River and the Crags. It had to be the same spot. Yet the tracks in the postcard were nowhere near where the tracks are now. I finally concluded that the tracks as they appear now are the result of a realignment and have been moved back, away from the river. My guess is that the old dirt road that follows the river now must be the old railroad bed. Walking that old road leads to the spot where I took my image. The perspective along the road would be very similar to what is on the postcard. Of course, the forest has grown up significantly sine the picture on the postcard was taken, but that is to be expected over the last 60-70 years. To verify whether I was indeed correct in my assessment of where the postcard picture had been taken, I tried superimposing the crags in my image over those that appear on the postcard. They were a nearly identical match! The river did not quite line up but that is not a surprise, since my image was taken at the water level while the one in the postcard is obviously taken from the top of the embankment, about 30 feet higher. Furthermore, I took mine during the spring thaw while the postcards is much later in the year when the water level is lower. Despite the slight shift in perspective and difference in volume, it is obvious that the river is rounding the same bend. I think it is quite conclusive. My image and the postcard were taken at nearly the same spot. The growth of the forest is quite remarkable, even though it is to be expected. Frankly, I prefer the areas appearance in the postcard rather than how it is today. At the very least, there is much less obstruction of the Crags themselves. Also, the lack of significant hardwoods makes the area more attractive, in my opinion. In spite of my preference, the spot remains one of the better views of the Castle Crags from down on the Sacramento River. Only that seen from the confluence with Castle Creek exceeds it. So what is the takeaway from this exercise? First, it is that I am an unrepentant geography nerd. Second, and more important, there are a lot of great vistas out there that need to be rediscovered. This particular view of the Castle Crags deserves to be appreciated more than it is! Reader Jeff Stone notified me that the trademark registration on the card would negate any date prior to 1952 and that the railroad was indeed realigned following the river’s flood of 1955. That would put the postcard’s date to somewhere between 1952 and 1955, which was right in my guess, based on the card’s design. He also linked me to another postcard that was taken in the same area. It must have been right around the same time, since all the trees are exactly the same! Awesome! Thanks Jeff! I appreciate the time line info and the link to the other postcard. It is surprising how close in time the two most have been. All the same trees are there. Do you know if Riverside Road was once a part of old Highway 99? It seems odd that the postcard I posted would mention the highway in conjunction with that spot. It also seems odd that another postcard would feature that vista unless it was a spot familiar to people. Either way, it is amazing that a spot once highlighted has fallen into total anonymity. Do you know if there are good resources or old maps available that document the old highway routes or the history of the interstate construction? I’m not sure about the railroad being realigned after the ’55 flood, that was just conjecture. But you may be able to compare the 1954 map with a more recent map to get a better idea. Do you have coordinates for the viewpoint? I’m still not sure where it is. Really neat historical detective work there, I really like the superposition of the photos. It’s amazing how much things can change in a short period of time!